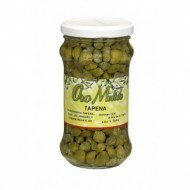 Buy Tápenas or Capers, Oro Molido, 6oz Aprox.Jar. Ideal for accompaniment in salads or as an ingredient in recipes with fish because its flavor combines perfectly with these preparations. Also ideal dishes with anchovies, fresh and smoked salmon. 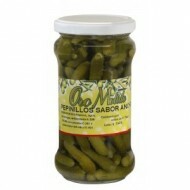 Buy Pickles, Oro Molido 6oz. Aprox. Jar. With great taste, very crispy and tasty. The can take as an aperitif with onions and peppers or if the dice, can be used for sandwiches and burgers, however if you decide to crush can taste the sauces and salads. Spanish Gourmtet Product. 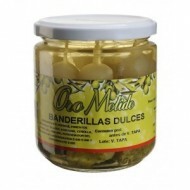 Buy Sweets Banderillas, Oro Molido, 6oz. Aprox.Jar. Selecting composed pickles gherkins, onions, olives and peppers. A very special and delicious combination. Spanish Gourmet Products. 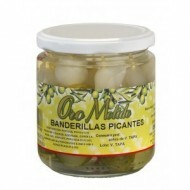 Buy Spicy Banderillas, Oro Molido, 6oz. Aprox.Ja. Selecting composed pickles gherkins, onions, olives and peppers. A very special and delicious combination. Spanish Gourmet Products. 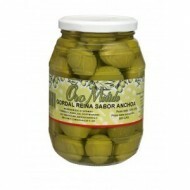 Buy Gordal Queen Olive, Oro Molido, 21 oz. Jar. Olive from Sevilla and variety Gordal Queen. This olive has been treated in the right amount of salt and selects only the larger ones each season. Spanish Gourmet Products. Buy Manzanilla Olive, Oro Molido, 12oz. Orza. 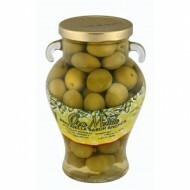 Manzanilla olives from Sevilla in his big size range and its just salt. Spanish Gourmet Products.